I joined in a challenge on one of my groups to use a daimond shape on a card. I pulled two designer cardstocks that were printed with diamonds and was glad to note that they were the same angles. I cut the grey one to create an aperture and aligned the lattice piece underneath before trimming both to the same size. 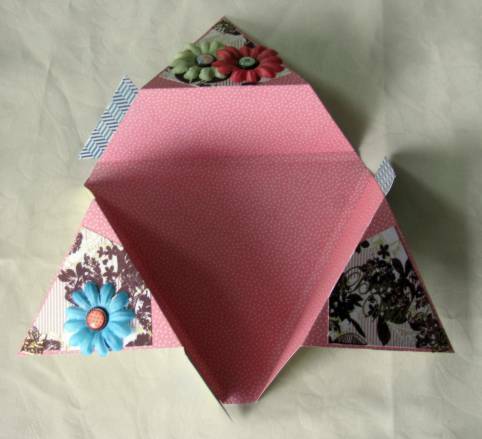 Then I scored and folded a long piece of cardstock into three sections - two at 4.25" and one at 1". With the 1" on the left I closed the right panel and added the lattice piece over it. Then I closed the 1" strip and mounted the grey piece, making sure to line it up with the edges of the lattice. I found a piece of printed vellum and mounted it to the inside of the grey panel. This also got a scroll-y silver peel-off border. 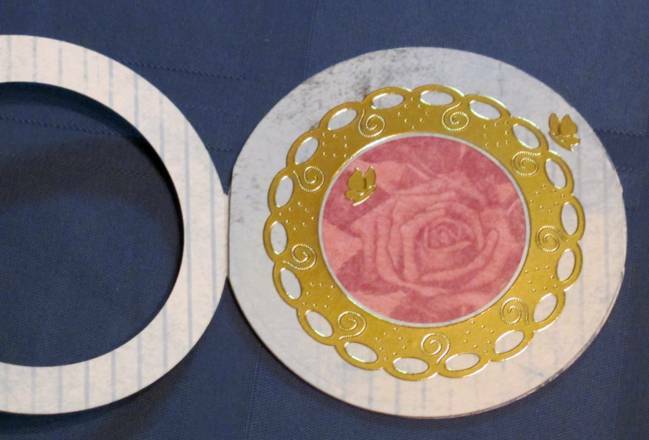 When you view through the vellum you can see the two rose stickers that are placed on the lattice. That layer also got silver peel-off corners. When the lattice layer is opened it reveals a silver peel-off greeting and more rose stickers. This is getting saved for a wedding card which I will need in a few months. 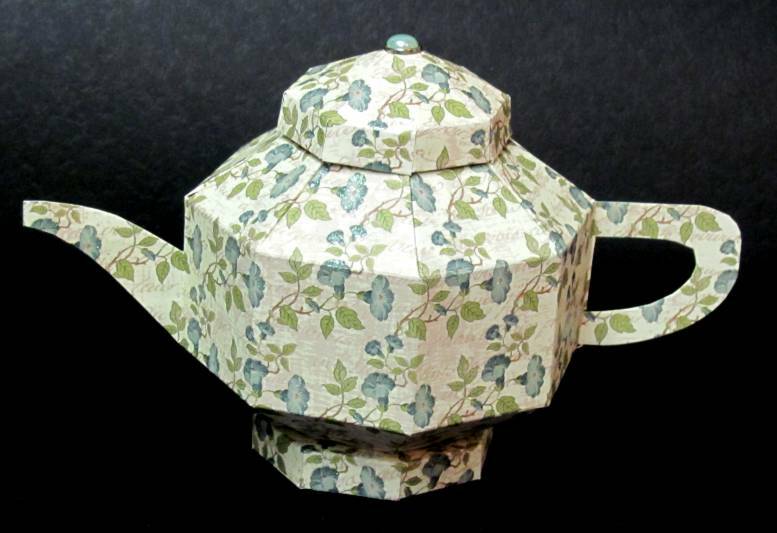 I offered to make a dozen of my paper teapots for a Mother's Day event. It had been so long since I made any that I had to reprint the instructions to follow! I try to select designs that look like they might actually be china. The event colors were pinks, blues, and purples but I had no luck finding suitable cardstock in purple, violet, plum, lavender... So I settled on a range of pinks and blues. It takes a bit over an hour to make one pot. But I did these assembly line (step one on all of them, then step two...) hoping to cut that down. No luck. It takes the same amount of time. These were used as table centerpieces with small pots of blooming plants inside. 12 ladies got to take them home as gifts. One group challenged a 'star card' and another challenged a 'triangle' card. I decided that a star card has so many triangles in it that I would use it for both challenges. I've never done this structure before and now I can say I have done it many times. However, this is the only card that resulted as I had so many problems with the measurements that the rest of the papers were creased every-which-way and ended up in recycling. I STILL didn't get them quite right on this as you can see at the edges underneath the blue triangles. Those should be perfect 60-degree corners not open holes. 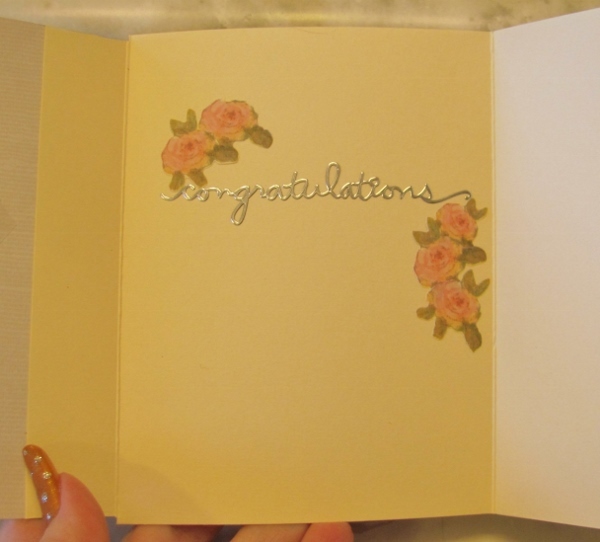 One other result was that this made the card too large to fit in a 6 x 6 envelope for mailing. I'll have to make my own envelope if I want to send this to someone. Over all, I kinda like it. 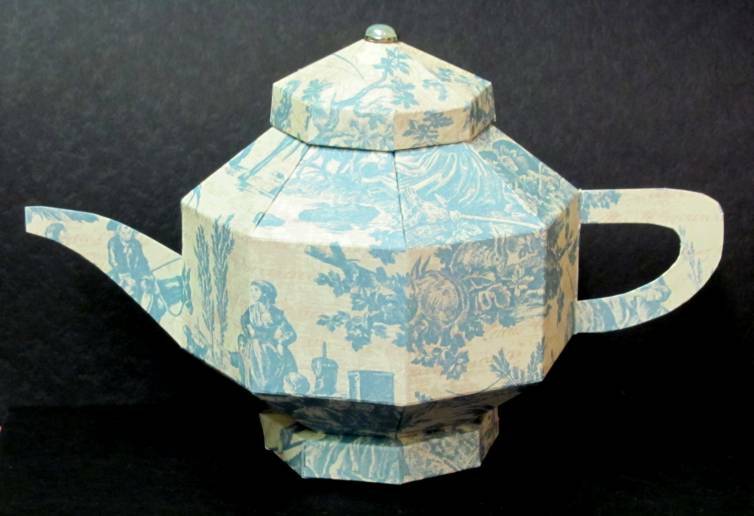 I'll have to dig out some truly ugly papers to fuss with until I can get those measurements right. 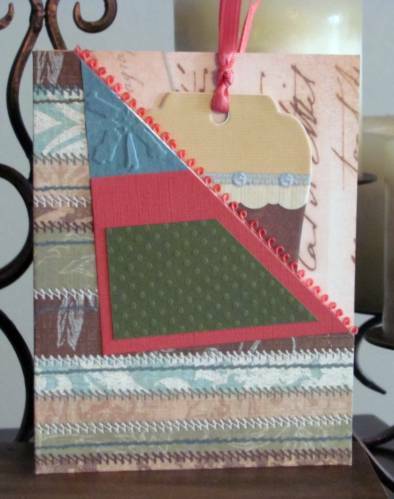 THEN I can make one that doesn't need patchwork on the front to cover up the mistakes and it will fit in the envelope. Here is a view of the card when it is opened. I did not do any decorating here. Yes, you can see inside where I double-creased, trying to fix those measurements. Sigh. Back to the drawing board. Need a card with two pockets? Neither did I, but I saw a neat tutorial for one and I had to go try it out. 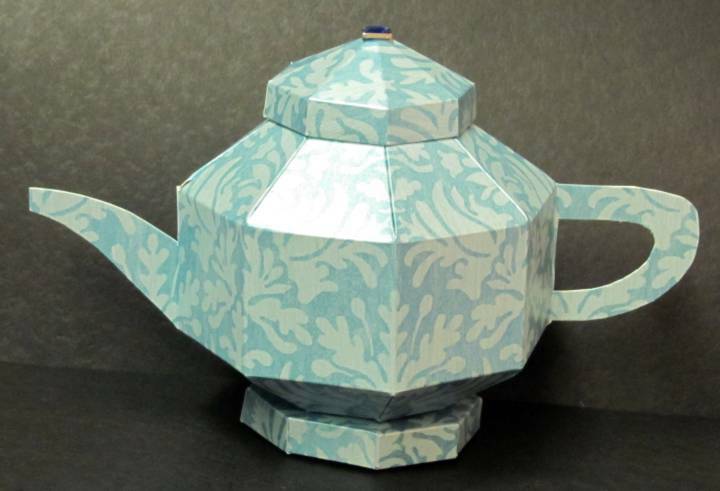 If you don't go to watch the video I'll summarize - this is made from a single sheet of 8 1/2 x 11 reversible cardstock. It requires 4 folds, no cuts, and a bit of glue. I filled my two pockets with pre-made tags mounted back to back so they are also reversible. The front decoration is made with some table scraps and I glued a bit of picot-edge trim to the pocket edge. Now that I got a taste of the Funky Fold (center step) format I really like working with it. So I used some table scraps and feature elements to whip together a couple more. First up is this adorable bunny from a scrapbook page-a-day calendar. I used an embossed background that is 'numbers' but by exposing only a bit of it it becomes an abstract design. The original borders of the page were cut and used as borders on the outer sections. 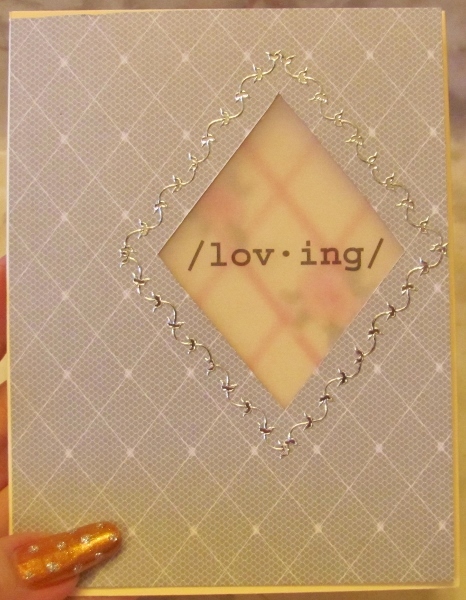 Added to that on the lavender base are a bit of frilly diecut border and a cardstock text sticker. Then I took a selection of super-bright elements and combined them for an eye-popping production. It started with the heart from the old stamp catalog colored up with watercolor markers. 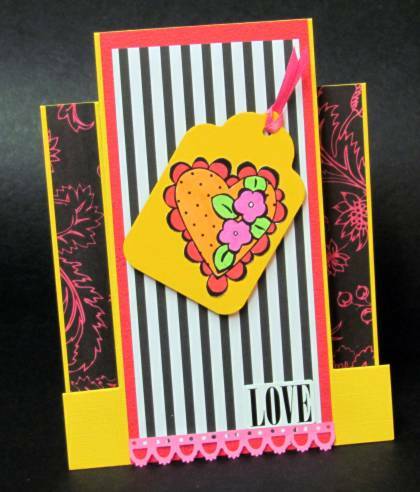 The black and white stripe came next followed by the pink border. Everything else just leaped on board! I'm not sure if I created this or it created itself. 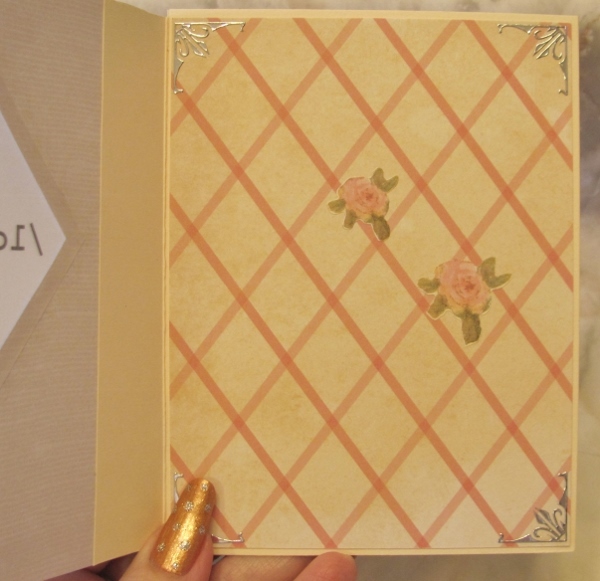 Some groups call this a center-step card but I have another style that I have refered to by that name. So when another group called it a Funky Fold I was good with that! I had never made one from this design. 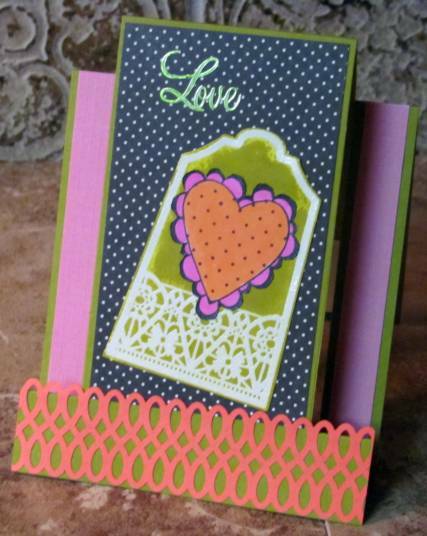 I used table scraps to decorate the front panel with black dotted paper, a color-me tag and a colored heart from the stamp catalog. 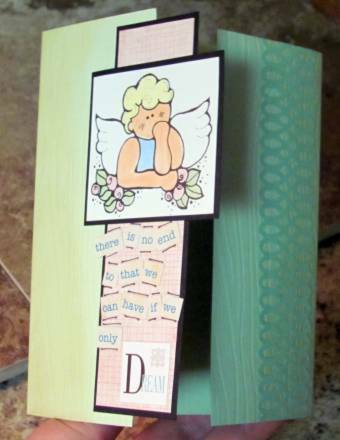 A diecut border piece I got in a swap fit the bottom perfectly and a couple of narrow strips finished off the sides. Silver peel-off stickers are great! You can color them with alcohol markers while they are still on the sheet so they match your project. I made mine green. 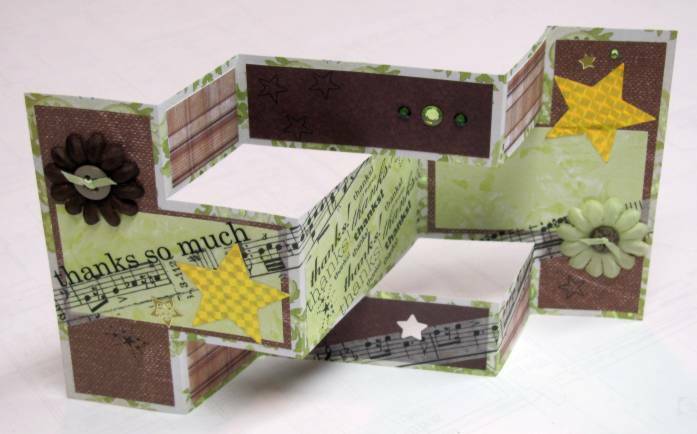 Challenge: Create a 'center step' card. I have made these cards before and wanted this one to be something different. I started with rather plain cardstock with a rustic print, not too much detail. Then I went to town stamping elements for a scene I wanted to create. 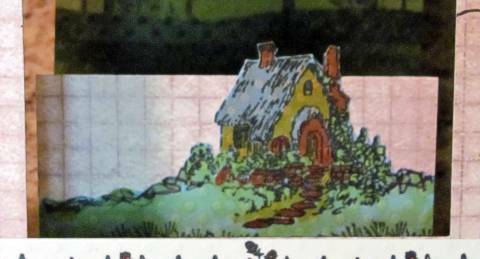 All the parts of the scene are stamped on the dot textured cardstock, colored and cut out for mounting. 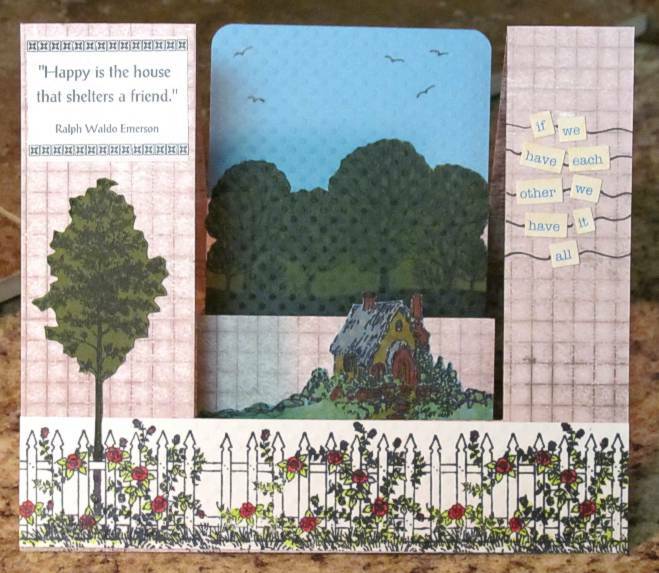 For the front panel I stamped a rose-covered picket fence and grass on white and an evergreen tree on green. 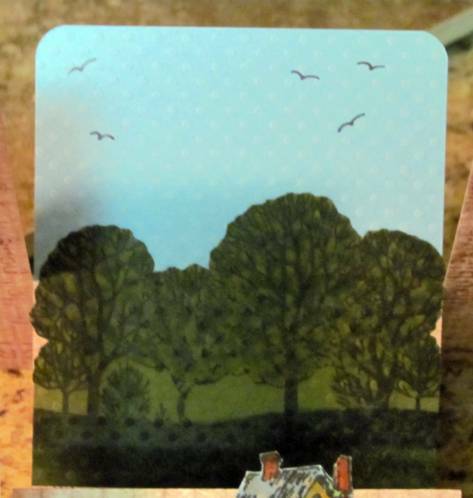 For the center panel I stamped a cottage on blue and added some more details to the right and left with a marker to make the scene the full width of the area of mounting. It also got some grass stamped at the base. When I mounted it, I let it extend above the fold of the card. For the back panel I stamped the trees on green and colored them with more green I trimmed out the top along the tree line and added a blue panel behind it, rounded the corners, and drew in some birds with a marker. Back on the front of the card I finished off with a text sticker on the left and more of the mix-a-phrase stickers on the right. These words were tied together with lines of marker. The whole design for this card popped right into my head so I just had to try and see if it would work like I imagined it. Success! The goal was to create one view with the card closed that would magically transform when the card was opened. I started by folding a 12 x 4 strip of cardstock into thirds and then folding the two end panels on a 45 degree angle to create the criss-cross. 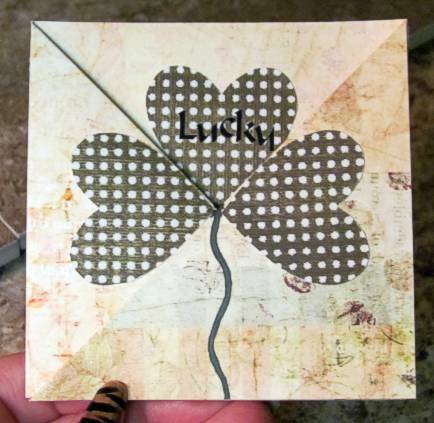 Then I stamped and cut out three hearts in green and glued them each on a separate panel with the card closed to create a shamrock. The center one got a rub-on that says 'Lucky'. 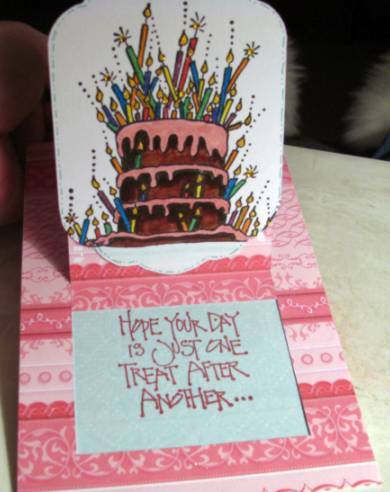 I also drew in a stem,refolded the card with the other panel on top and drew in a stem again. This way it is complete no matter which panel gets folded in first. Here is where the magic happens... by pulling on those two angle folds the card opens to its original dimension and all three hearts are now upright! 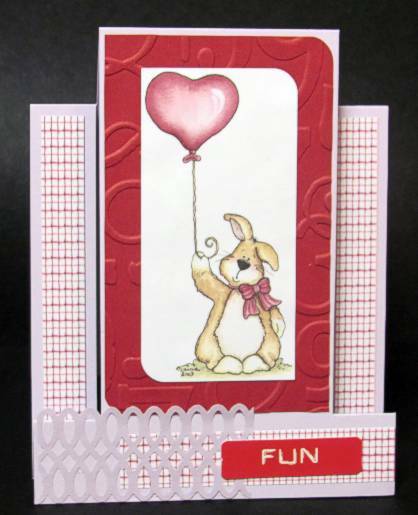 I stamped more of the same hearts, using red ink, making sure to keep them in the area that would be hidden when the card is closed. I extended the 'stems' that appear on the front cover across the whole card so they now form a horizon line. Then I drew stems for all the hearts and drew and colored leaves as well. Finally, in the spaces around the center green heart I added rub-on words 'in' and 'love'. So, with the card closed it is a shamrock that says 'Lucky' and when opened it is a garden of hearts that says 'Lucky in love'. This was one of those stamps from the dollar bin at my local craft store. 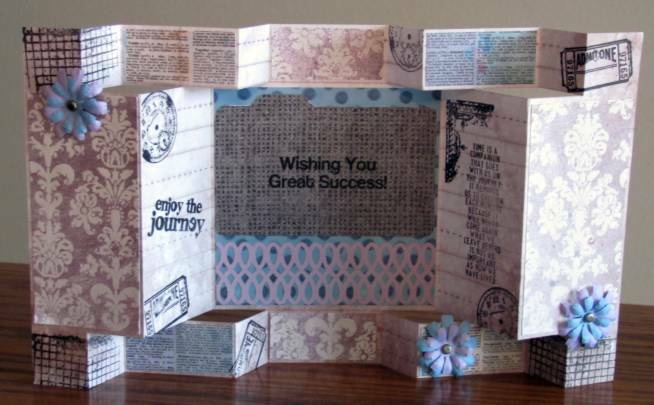 Challenge: Create a card with a Gate Fold. For those 'not in the know' this is a card which folds in equal amounts from each side so the edges meet in the center of the card. 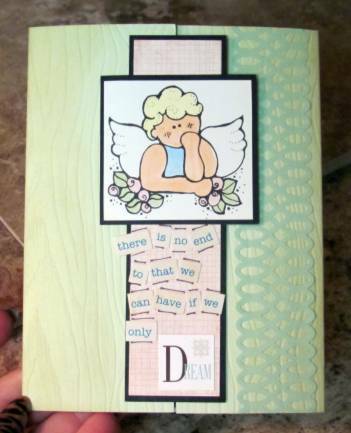 I started with a green cardstock with a woodgrain texture and folded my card base. 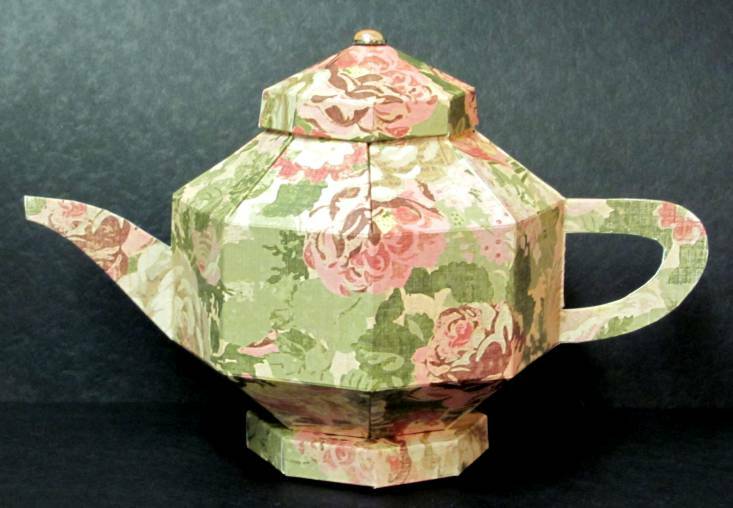 Then I used 'old paper' distress ink to bring out the woodgrain a bit. 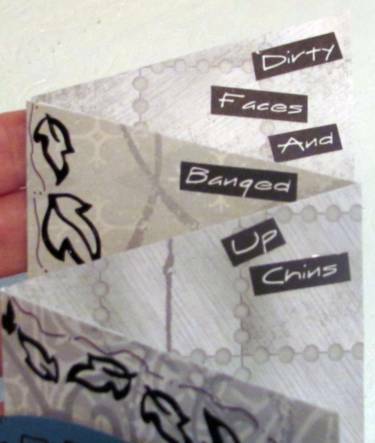 I bordered a piece of designer paper and a stamped/colored image each with a thin black border and layered them. These were adhered ONLY to the left panel so they swing away when the card is opened. I added a punched green border to the right panel. The text is made up of tiny word stickers. These come on a sheet and can be mixed and matched to create phrases. It's kind of like playing with refrigerator magnet poetry. I added a few marker lines to tie the phrase together and finished with a single sticker from another set. Here's a view showing the card opening. As soon as I read the challenge this idea popped into my head. 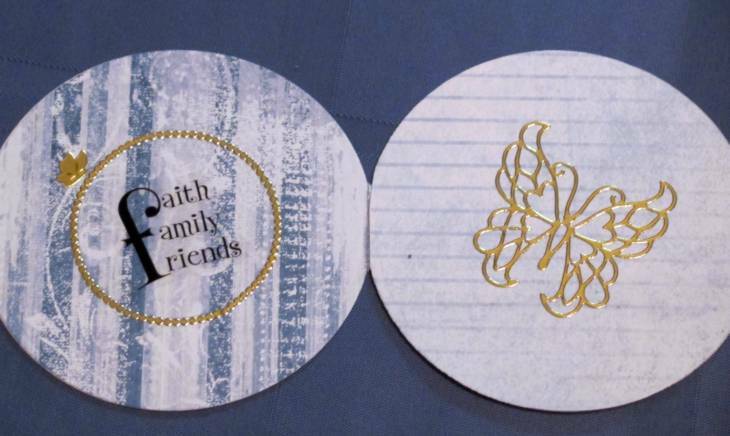 I used a double-sided printed cardstock, multiple sizes of Spellbinders Nestabilities (round) and some images and gold peel-off stickers. This is the front view with the card closed. The front is cut with an inner circle so the next layer shows through the aperture. 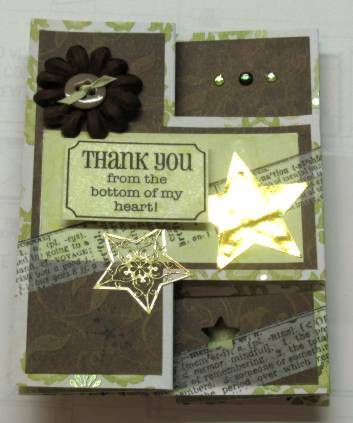 I used a gold border around the outside edge and a tiny gold butterfly. It hinges on the left side. When the first layer is opened this is the next view. 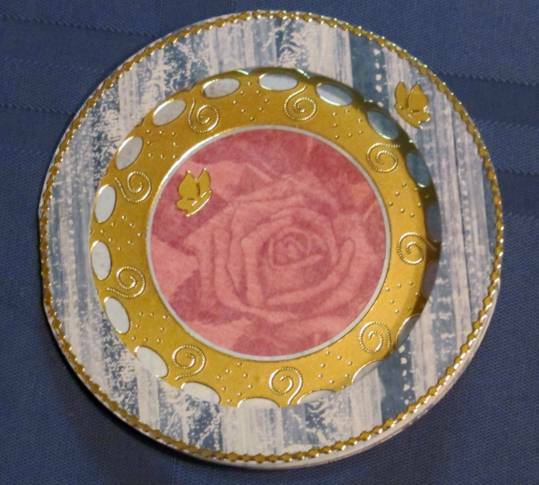 This layer has a circle cut out and a rose-print mounted behind it. 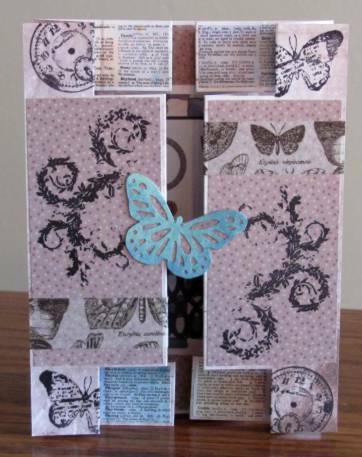 I added a gold medallion sticker as a border and two more tiny butterflies. This layer hinges on the right side. When the second layer is opened this is the final view. I lined the back of the rose from view 2 and added a large gold butterfly. Then to the left side (which is actually the 'center' panel I added a gold border and a clear text sticker plus a final tiny gold butterfly. Not sure whay I would use a card like this for but it does fulfill the requirements of the challenge. Challenge: Make a Double Display Card. 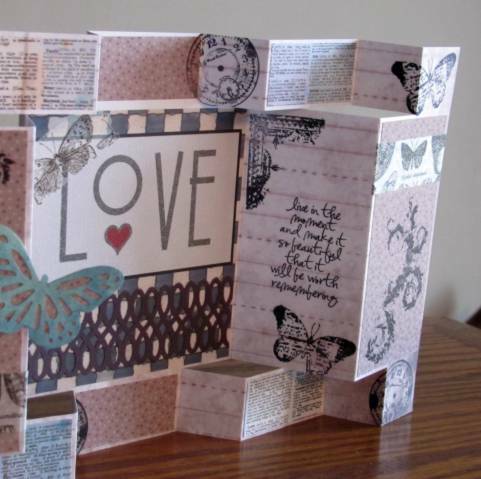 We were given a link to these instructions http://paolaspaperhaven.blogspot.com/2011/08/dbl-display-card.html as a starting point. Since the plan starts with a 12 x 6 cardstock I cut a 12 x 12 in half and made two cards with the materials. 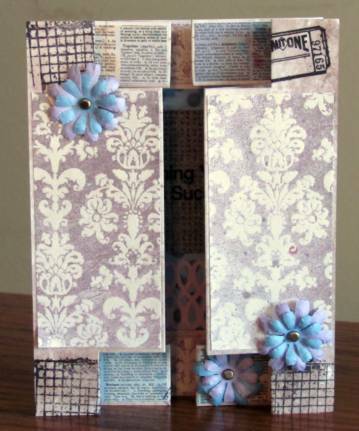 I used three coordinating papers on each card and a lot of the Tim Holtz stamps from Stampers Anonymous. 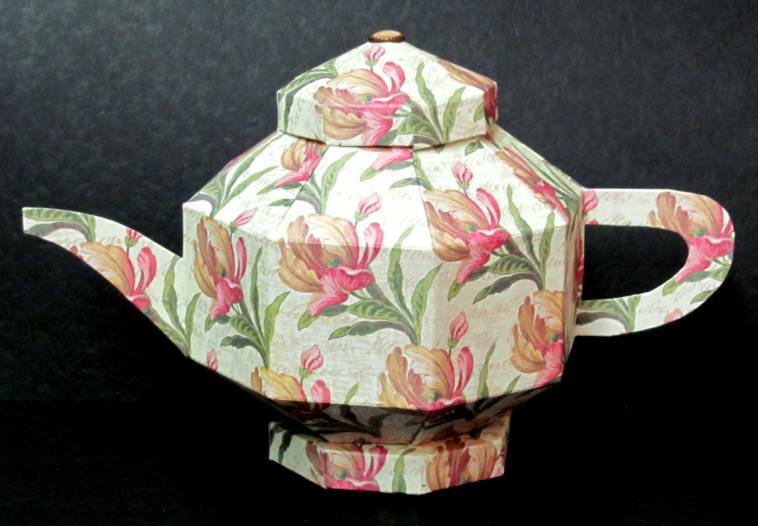 This one has a front with sprayed ColorMe papers and is decorated with punched paper flowers which are burnished to cup the petals and layered with brads. 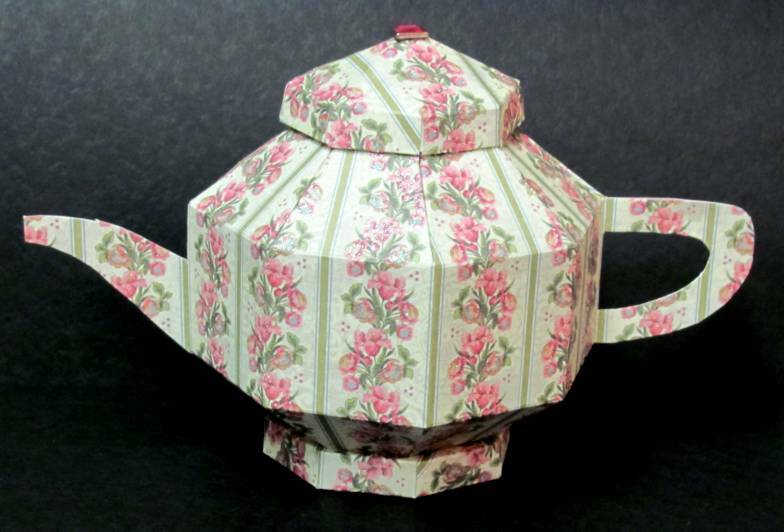 Here you can see how it looks when it is pulled fron the sides to fold open. This view from the top shows how all the folds are created. 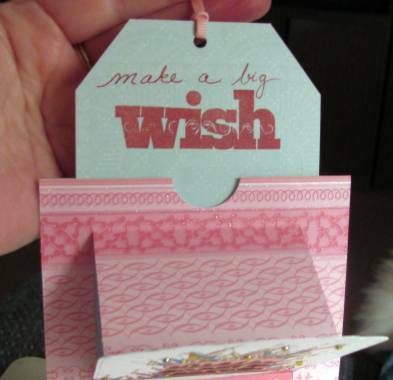 The other card uses a spotted paper on the front, stamped and havingtissue tape applied. 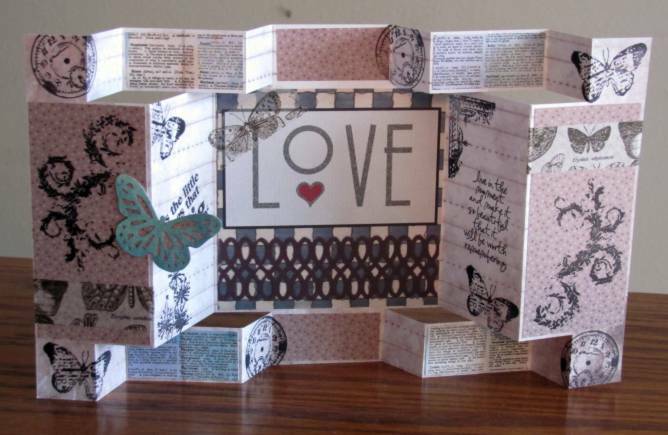 I also attached a punched butterfly on one side only so it would bridge the front gap. Here is the full open view. When open there are medium panels on either side for stamping. It really only looks complicated but is deceptively easy to construct. As the last project for the ladies' retreat I made 'thank you' cards for the speaker and worship team. These are made with the Shutter Card format that I got from the Scor-Pal website. I started with a green printed cardstock as the base and did all the measuring, cutting and folding on that. I then added several papers in apple green and chocolate brown (theme colors). To the speaker's card I added tissue tape with text imprinted. The musicians got tissue tape with music imprinted. I added pulled out a brown and a green silk flower, brown buttons and green 1/8-inch ribbon (to tie through the button holes). 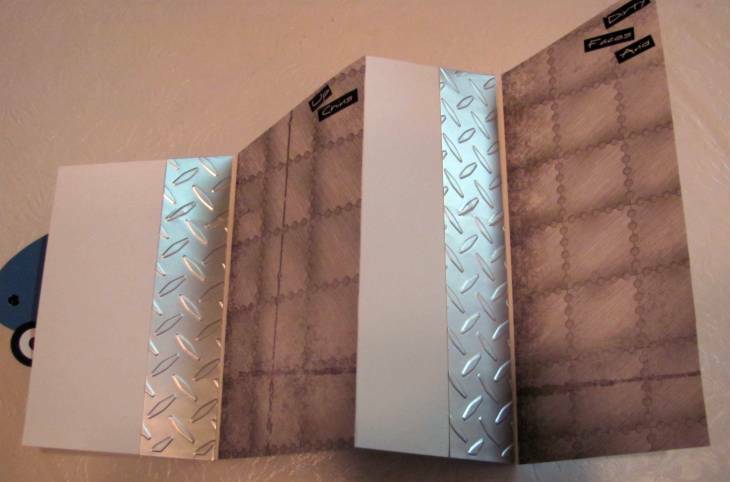 These were layered and attached with glue dots on the front cover and the back page. Large gold stars, gold peel-off stars, punched star holes, stamped star outlines and stamped starbursts are scattered throughout. 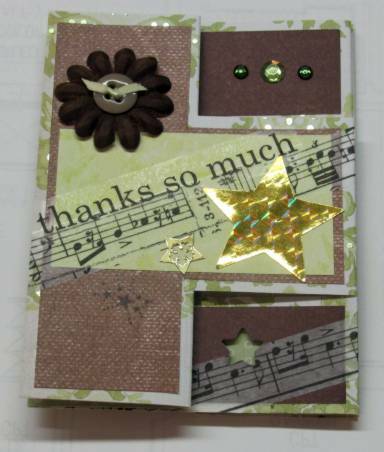 I added green rhinestones to the upper right of the center section so they show when the card is closed. I had a stamp with 'thank you' repeatedly on it so I stamped it twice on the inside panel and filled in around with the starburst stamp. This leaves the last green panel for a personal note and signature. Sometimes an idea just pops in my head and I have to go try it right away. Such is the case with today's project. Question to myself: I see everyone making those cool pleated rosette flowers. I wonder if it would work to cut a strip of cardstock and punch it with edge trimmer, pleat on the bumps and valleys. Answer: Yes it does work to some extent. The issue is really the 'spread' of the design in the border punch. The one I had at hand folded at just under 1/2 inch making for a very tall bloom. Solution: Find another use for it instead of a card. So I added a rhinestone on a stem to the center, mounted the pleated flower on a big glue dot. 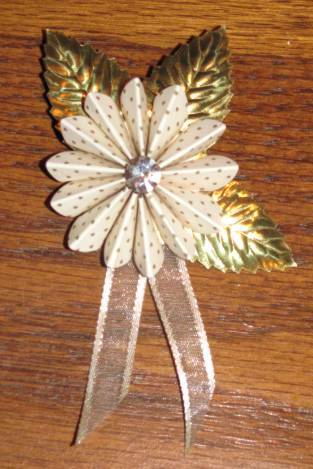 To this was added three gold paper leaves (left over from cake decorating days), and two strips of ribbon. I backed this with another glue dot and backed it with a punched circle. Another punched circle got slots cut into it and a pin back fed through. Then glue dots hold whis circle to the rest of the pin. Cute, eh? But being paper it won't be durable. I wore it once and it looks nice, though. 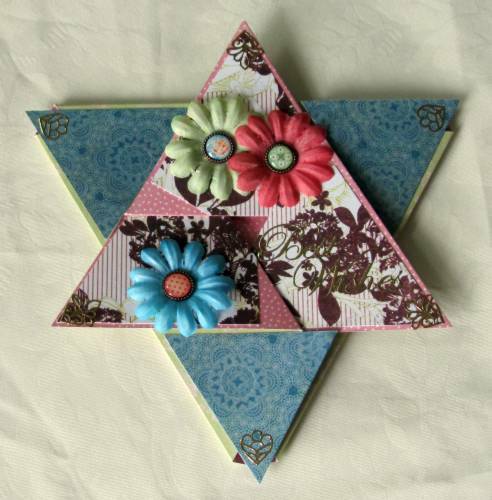 If I were to do another I might leave off the pin back and use it to decorate a gift box as a permanent 'bow'. 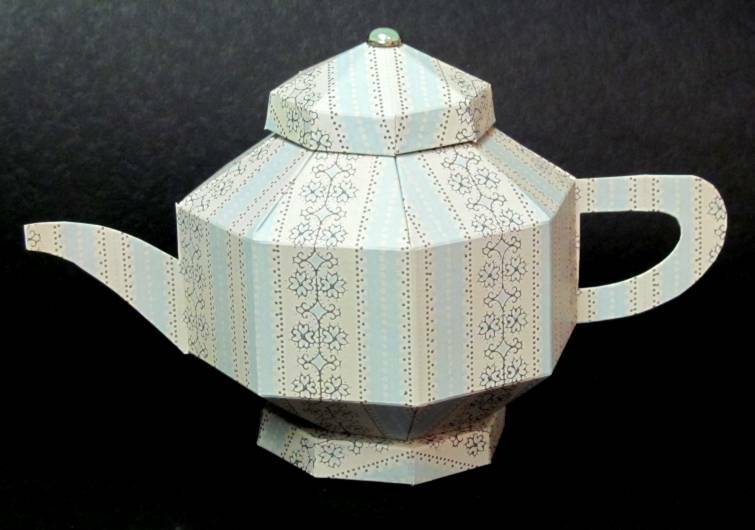 So for a revealing gift (I had to squelch my crafty urges for three months so she would not guess who I was) I made her one of my teapots and then used the other 1/2 sheet of cardstock to make a matching teacup - designing it as I went along. 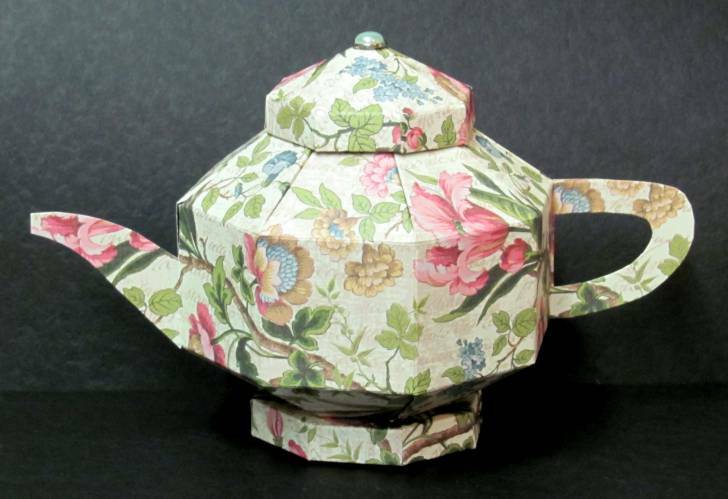 On a closer look at the teapot you can see that I used a rose-shaped button for the knob on top. It was frosted white so I made it match the purple by coloring on the bottom of it with Sharpie marker. This way the color is muted when it is viewed through the button. Here is a closer view of the cup. If I were making it again I would make the straight sides shorter. This is more the height of a coffee cup rather than a tea cup. 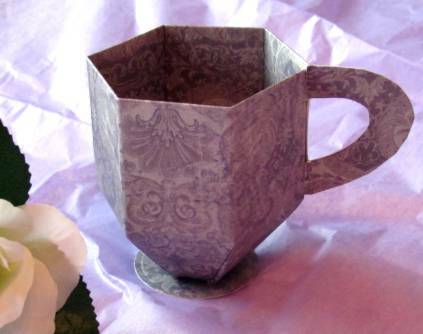 You can see that on the cup I folded over the upermost edge to make the cup lined rather than showing the inside of the cardstock. 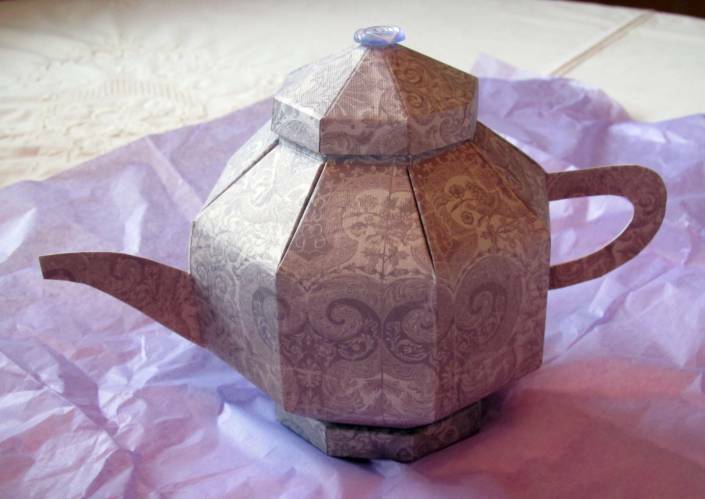 This only goes as far as the folds where the cup begins to curve in at the bottom. I also used a plain circle of the cardstock to make a foot for the cup as I was very short of supplies at this point. I had never done this structure before but it went together nicely. 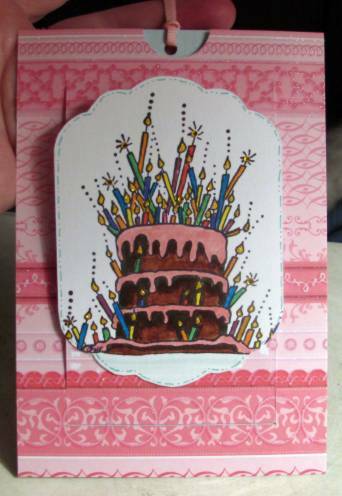 I started with a stamped image that I had colored with markers and glittered. 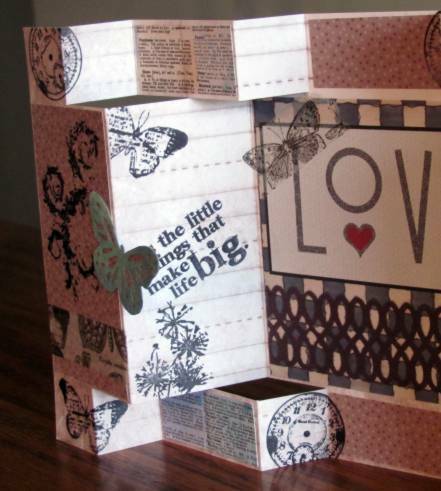 This was cut out with a Nestabilities labels die and used as the focal peice. 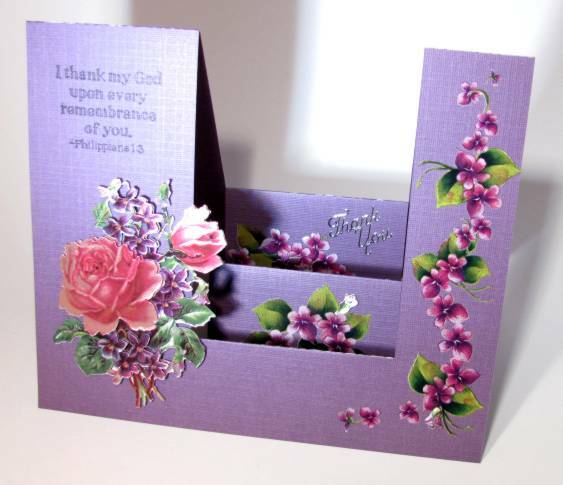 The card is constructed of a back panel, a sliding insert, and a split/folded front panel. 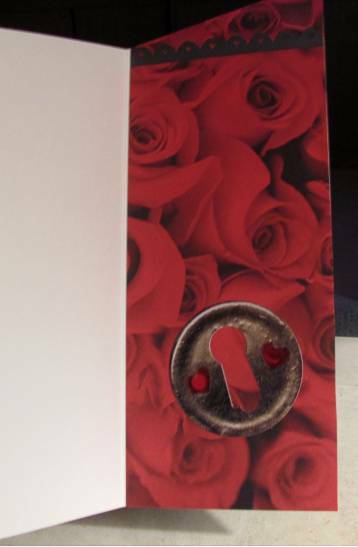 The bottom of the open part of the front panel is attached to the sliding insert so pulling up on the ribbon collapses the front to reveal a stamped greeting inside. An additional greeting is revealed on the panel top that is pulled up. 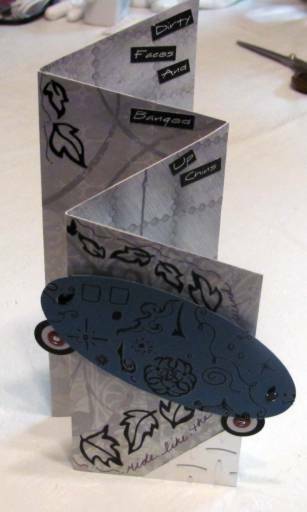 I already had the cardstock cut and folded - leftover from the skateboard card. 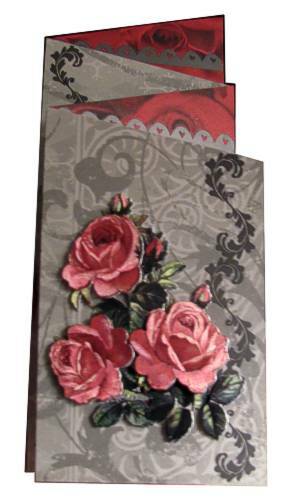 I lined this one with rose-printed scrapbook paper and added 3D foil roses to the front panel. Well, really nothing fantastic about this at all. 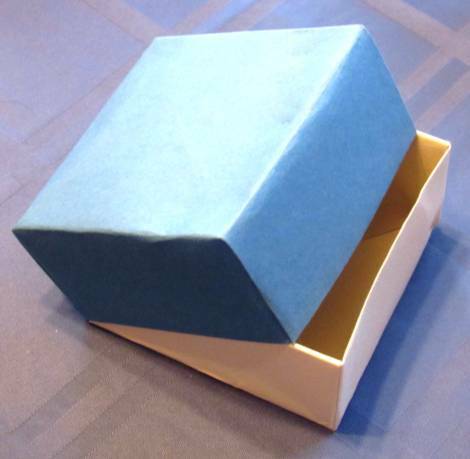 One of the cruise activities was to learn to make a box... been there, done that. But with no cost involved I thought I'd go check it out. Came in late, sat down and started folding away. "Wait," she says, "you'll need me to show you what to do." (Ummm, no!) So I kept on folding and she kept on instructing the rest of the group how to do it her way. 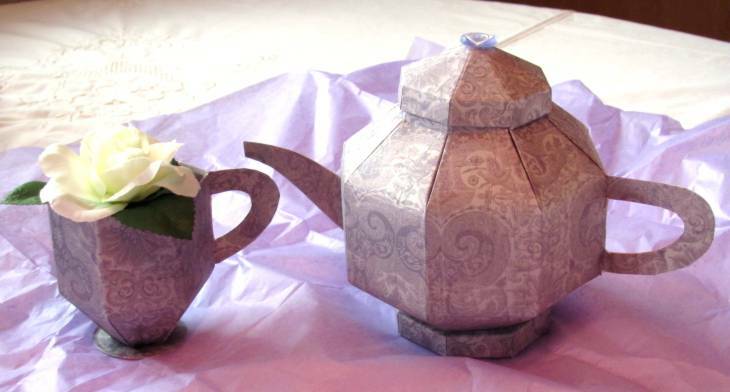 She used the method where you cut the sides before folding the box and only provided decorative edge scissors! AAAAKKKKK! When we were done I realized the top and bottom could not be nested without squashing the sides of the base. SOOOOO tacky. 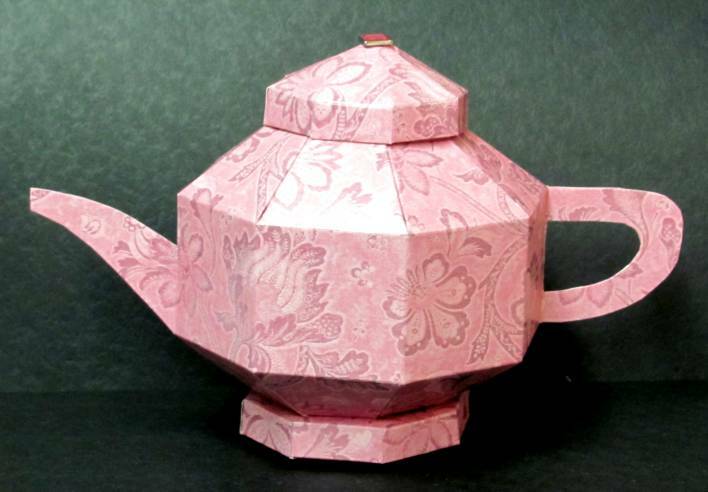 1) make the base paper 1/4 inch smaller in each direction so the lid will slide on. 2) Don't make those first folds across the middle, but rather MARK the middle. This way you dont have big creases across the center of your box. 3) Angle fold the 4 corners instead of cutting them and you have a box with all finished edges rather than cut corners that are weakened. Nothing special to look at but a good teaching tool and I had something to carry a few trinkets home in. As I was sitting in a restaurant at Christmas I looked up and saw their huge 5-point 3-dimensional stars haning from the ceiling. 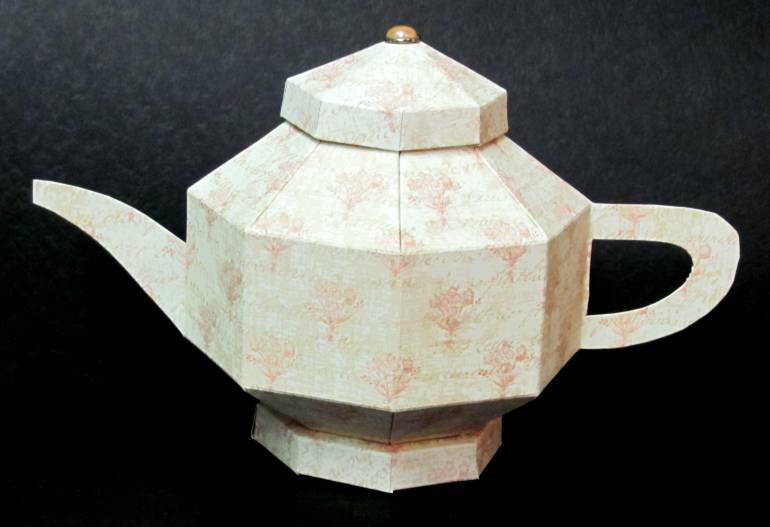 While waiting for service I started trying to figure our how I could construct one using 5 sheets of 12 x 12 cardstock. I drew on my napkin. When I tried to use those sketches, though, I wisely used paper instead of cardstock and scaled back to 6 x 6 sheets. As it turns out, you cannot make a 5-point star from my design. You CAN, however, make a 7-point star! I added gold Stickles along the creases and ridges of each spoke and placed a giant flower brad in the center. 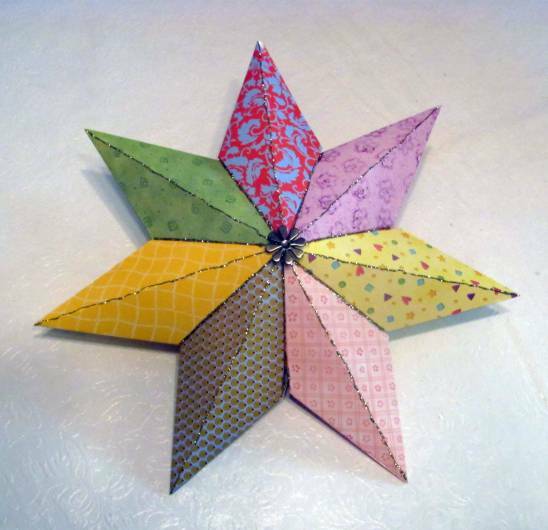 This is a two-sided star - the same on both sides - so it could be hung from the ceiling... maybe in a restaurant! LOL! Assignment: Make a card for a teenager. 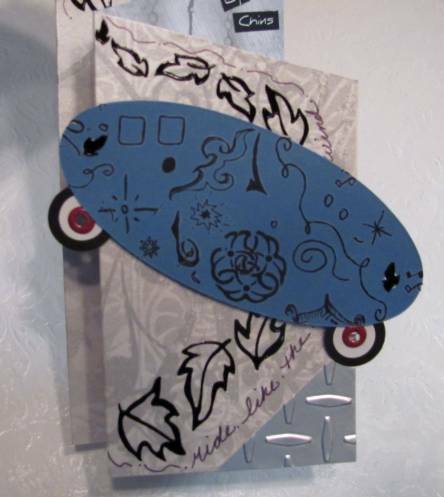 I had a brainstorm about using an oval tag as a skateboard by adding wheels. It actually worked much like I envisioned, though the tag was wider than I remembered it. I used rubons to make it look like it was covered with graffiti. The wheels are black circle punches, hole reinforcements and eyelets. 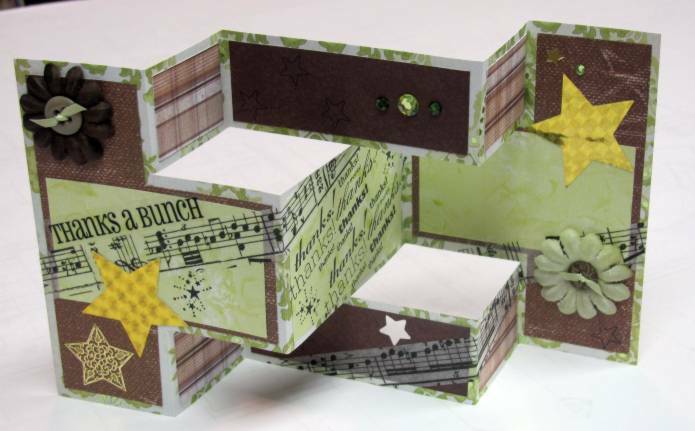 I accordion folded a 12 x 12 cardstock then cut on an angle to make a multi-level top. I decorated the front with bits of silver card impressed with diamond plate, black leaf stickers, and handwritten text "ride like the wind". On the inside I added more diamond plate and some industrial-looking scrapbook paper. I have no idea if a 'real' teenager would like this card, but it worked for the swap I was in. Are these forget-me-nots or violets? Maybe they are neither? Maybe some are one and some another? So, we'll call them little purple flowers. The main image on the left is a 3D foil element. The rest of the flowers are rub-ons (mostly) I had three little pieces of the 3D I left off and scattered them around. Can you find them? A stamped text and a silver peel-off text sticker finish this off.